The United Dairy Industry of Michigan (UDIM) honored Ramona Ann Okkema-Clark of Blanchard, Michigan with the 2019 Excellence in Dairy Promotion award at the Great Lakes Regional Dairy Conference. This award recognizes one outstanding Michigan dairy farm family member for their dedication to promoting dairy foods and their local dairy community. Ramona was nominated by her son, Dirk. 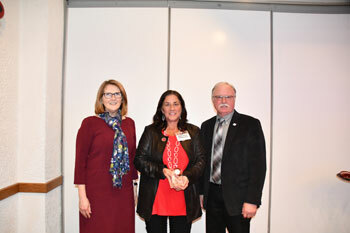 Sharon Toth, UDIM CEO, (left) and Jim Reid, Michigan dairy farmer and UDIM President, (right) present the 2019 Excellence in Dairy Promotion award to Ramona Ann Okkema-Clark of Blanchard, Michigan. Ramona organized the Montabella School Carnival, where students learned about farm animals by interacting with lambs, calves, chickens, ducks and rabbits she arranged to be at the carnival. She also brought Maxine — a simulated cow for the children to milk — to help them learn more about what cows eat and the nutrition benefits of milk. She implemented UDIM programs in her local community such as a Jump with Jill event at the Montabella Elementary School and also applied for and received a Nature’s Sports Drink Grant for the Montabella High School football team. For the last 15 years, Ramona and her family have built a float for the local parade. Each year, their theme focuses on educating the public about dairy farming. Her family hosted Breakfast on the Farm in 2014 for 2,000 people. Ramona also continues to volunteer at Breakfast on the Farm when other farms host the popular event. She passed out milk to runners at the finish of a cross country meet, while also offering participants and attendees dairy nutrition facts and other UDIM handouts. For the past 10 years, Ramona has volunteered in the Montcalm County Little Red Barn which sells dairy foods at the County Fair. She also volunteers at the Great Dairy Adventure answering questions about dairy. Ramona serves as a Dairy Communicator for the Michigan Milk Producers Association. 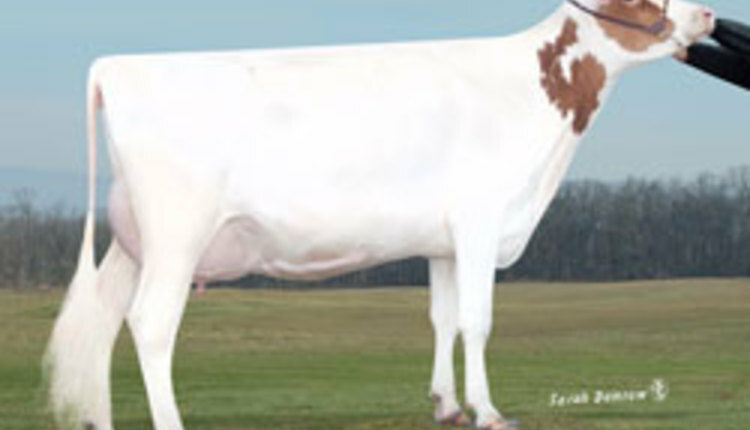 In this role, she attends meetings and shares dairy’s story with the public. If you are interested in nominating someone for the Excellence in Dairy Promotion award, nominations will be accepted for the 2020 award winner from November 1 – December 31, 2019. Contact Jolene Griffin at Jolene@MilkMeansMore.org with questions about the application process. The United Dairy Industry of Michigan (UDIM) is dedicated to serving Michigan’s hard-working dairy farm families and promoting Michigan’s locally produced dairy products. UDIM is the umbrella organization for the American Dairy Association and Dairy Council of Michigan. These non-profit organizations provide dairy product promotion and nutrition education services on behalf of their funding members. To learn more, visit www.milkmeansmore.org.